All about the best team in the land and all the world Manchester City!!! : Toure fee agreed? 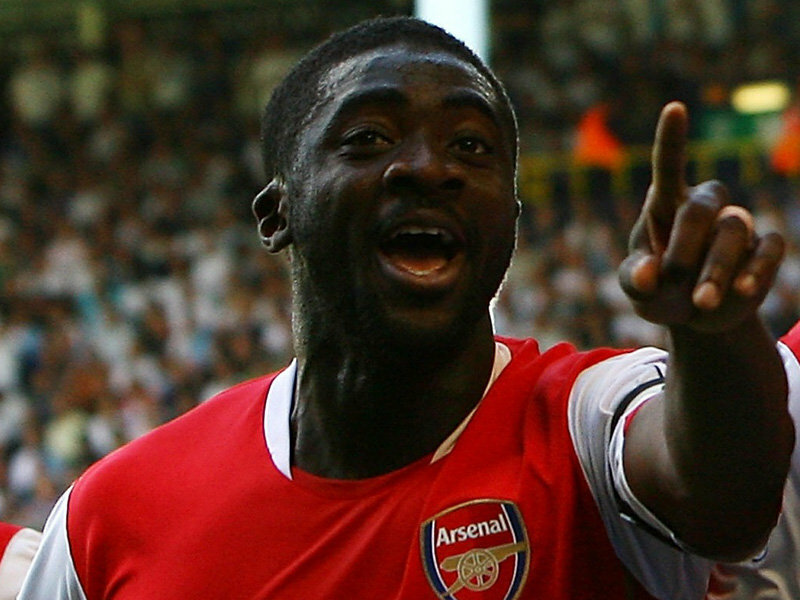 Sky Sports News are reporting that City are close to agreeing a £16 million fee with Arsenal for Kolo Toure. If we pay £16 million we will be paying at least £3 million to much, I am sure City fans will look past that though considering how good he is. I really hope this transfer happens, I have been a long time admirer of Kolo Toure and get ready for this but I hold him in higher a regard to John Terry. More to come if the transfer is confirmed! Love your blog, but please alter the colour scheme....it's too hard to read the white text on the light blue background. Thanks and the colour has been a problem for people from day one, I am finding it really hard to find a good compromise, please bare with me on it. 16 mil for a player who is way past it is another fantastic bit of bussiness from Arsenal. They have absolutley robed citeh for 41 million pounds, and they got to show? An arrogant, lazy, money loving mercenary, soesnt know the offside rule and thinks he is gods gift to football, and a past it defender in kolo toure. Toure has not been the same player since sol campbell left the club. He needs a defender thats bigger and stronger then him, and dunn dont fit the bill. Well Kolo's off to ya, hope it comes through. We bought Vermaelen who is better for 10m and we're selling a guy past it for 16m that had 1 year left on his contract. Good business by the Gunners. 41m for 2 players that could be replaced with ease. Just highlight the text like everyone else does by clicking and dragging over text its not much effort you won't even lose any weight :) I hope we get him the more good players the better. I am not sure I agree with your opinion on him being past it and Vermaelen is not better in my opinion either. I am a bit surprised about these two comments because all the Arsenal fans I know from a sports site I am involved in have so far told me they want him to stay. Change the colour and turn on the spell checker for Gawds sake. Anon nice bit of advice, good solution for the time being. There is nothing wrong with the spelling is there, what is spelt wrong? Well as a season ticket holder i can tell that toure is not half the player he was in 2004. that was the last season that he was an immence centre half. The reason Arsenal fans see it as a mistake selling him is because we have not replaced him yet. There are better and younger center half's out there who can do a better job them Toure. Toure runs like a headless chiken on occasions and gets caught out, and has a habbit of not being able to deal with set pieces and long balls. You will find out soon enough what a steal Adebarndoor was, and the same you shall see with toure. You saw it here first. I am waiting to see with Adebayor because every single Arsenal fan says the same thing about him, but Toure he has totally lost it over night? £30 million to (too?) much. There are a couple of other things but life is probably TOO short. Tip, make your text gold, the same colour as the Eagle on our Crest, it will work, check my blog for example Gary. Will make for easier reading and look good. Thanks bud I will look into it, it might not look as good here as it does yours though because of my lighter background. The only issue i have bout toure is that he joins in the attack way too often, leaving the defence exposed. Apart from that he is a legend, makes me wonder what wenger sees in silvestre. i for one think that both teams know what they are doing here. this is a good deal all round. toure is not past it, he is 28 for god sake..
i just think he is past it for arsenal..
his decline started 2 seasons ago when he returned from ANC with an illness, he never really recovered for the rest of the season.. then his spat with gallas didn't help either and now one of his best mates leaving is not helping.. i think kolo will prove to be a fine defender for city..
its a real pity though.. i wish things would have worked out for him at Arsenal.. I hope that dutch fellow we got will be able to fill in..
Drew, kolo lost it when Sol left the club... Fact. Both just need a new challenge and to feel wanted. They are excellent signings - interesting to see what Wenger does with the money though. Can we chill out on calling Arsenals fans retards, I like to hear their point of view and whether right or wrong in their opinion, they are still allowed one on my blog. Obviously the people who are commenting on your blog colour scheme are the same folk who have been watching Toure and Adebayor. Slightly defective in the eyesight department to have missed the 30 goals and even despite injury 15 the next season. Hopefully they were impressed with Ade's involvement in South Africa, despite the loss. I was there and watching Barry and Adebayor and honestly liked what I saw. Both Ade and Toure add to our team's strength and hey, even if they don't work out, the price of oil is still rising and the money will keep coming. Actually talking about cocky your a bit there yourself, we are not all the same. The mancs? We are the Mancs ya clown. I presume you mean Stretford Rangers? You just hope we fail....thats the difference....you hope! We will see come next may.... oh and you will see what we are made of when we see you at our place on September 12th. Gary - I thought this was a City blog? First City blog I've been on where I've been told off for calling Arsenal fans for christ sake. You may be interesting in hearing totally fickle biased views from them but I'm pretty sure you will find a huge chunk of City fans that are not. Sorry pal! Well it is a bit fickle calling people retards to be fair, as well as being a huge City fan I am a huge football fan and a wider variety of opinions is interesting to me. I mean call me silly but I am a 21 year old man, I am not in to name calling, it would just go back and forward if we went down that track. Don't get me wrong though Woodsy your opinion is very important to me as well and I am grateful that you read my blog, but you must know what I am saying pal. Definition of fickle is - changeable in purpose, affections etc. Not sure how me calling the 'fickle' Arsenal fans retard is therefore fickle. If you don't want this kind of banter on your blog Gary thats fine. I'll do one. But I am just one of a growing number of City fans that are sick to death of listening to fans of United, Arsenal, Chelsea and Liverpool dismissing our chances and trying to undermine the signings we have made. United fans (and fergie) are doing it with Tevez. Arsenal fans are now doing it with Adebayor and Toure. Even the some Chelsea fans made an attempt to do it when they thought they were going to lose Terry. We've rattled em and I'm sorry but the Arsenal fans that come on here teying to make out those 2 players are poor are in my opinion....retards! I do not mind the banter but some people might, so I am trying to do my best for all concerned. Of course they are having a go at us, they are worried sick about our potential, it is best to take it with a pinch of salt though. And you gave a fickle response - 'retards', an unsincere or not serious response. Its rather obvious they're gonna get hangeland to replace toure...why can't hughes look at players like hangeland instead. We have the money and he's a hell of a monster, why isnt this working? TBH im rather dissapointed with our manager... we need a more established man that players want to play for, why cant we try and offer hiddink or rijkaard big money to lead us? Anyway this could pave a way for mourinho to manage us when hughes gets sacked in january. Agree with citycity on hangeland. I am not sure Hangeland is as good as Toure to be honest. As for Hughes his signings have been impressive get behind him and give him a chance. You mention Rijkaard he has gone to manage Galatasaray what ambition is he showing by going there, not sure why you would want him.